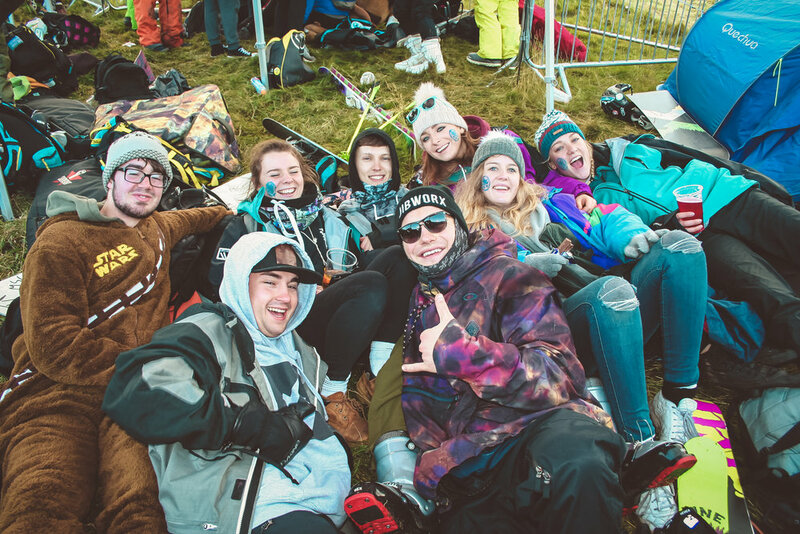 November is an exciting time in the student snowsports calendar as every club in the UK gets together to meet, greet, compete, and try and stay on their feet during two days on a muddy hill outside Edinburgh. This year got going in traditional style with a launch party hosted by EUSSC at the three sisters. It was clearly the place to be because the party was crashed by Red Bull athletes Paddy Graham and Bene Mayr plus pro riders Thomas Ritsch and Lukas Joas for the screening of the new Legs of Steel movie, Same Difference. Friday morning heralded the start of competitions and snowsports clubs across the city were dragged unceremoniously out of their hostels by race captains. You have to pity the racers arriving at 7.30am but at least the sun was out! Stony faced and bleary from too much fun the night before, competitors got their heads in game and the day kicked off with a qualification jam on the slopestyle course and slalom and board GS on the tow slope. To get the momentum going, the Red Bull truck was blasting tunes from the early morning and extra speakers in the middle of the slope ensured the freestyle zone got an earful too. I think it’s fair to say that the Dry Slope Championships has turned into a mini festival for snowsports enthusiasts with unis bringing gazebos, huge speakers, plenty of blow-up sofas and a great selection of props to cheer on their teams. Inflatable crocodiles, pigs, lions in wheelbarrows and party sloths were all in attendance and loved by the crowd. The gazebos, however, proved a handful to contain for the universities that brought them to shelter from the Scottish elements. A few even went walkies off-piste in the high winds! After a long day on the hill, a few pints and a couple of Jûbels later, the official after party got into full swing in Liquid Rooms with Triple Cooked served up healthy portions of house and disco into the small hours. On Saturday, competitors had another early start with the boardercross and Ski GS firing the starting guns at 9am. Although slightly bedraggled, spectators still made it up the hill in droves to cheer on the athletes and by the time the big air finals were running, the hill was packed out. Luckily, the rain stayed off but that didn’t stop the mud being churned and a quagmire took shape half way up the hill. The riders brought an insane amount of entertainment in the form of several spectacular bails, a few double front flip attempts and a couple of ultra-sends ending up in a stretcher. The highlight had to be the traditional train when the freestyle talent turned up the heat and hit the kicker one by one for an incredible finale to the contest. Unlike previous years, the prize giving took place on the slope so the athletes could celebrate their victories in front of the huge crowd and lap up the glory. The celebrations continued in Atik nightclub with three rooms of massive tunes to keep athletes and spectators dancing into the night. We probably shouldn’t mention the unofficial Strathclyde after party but if the rumours are true, they sent it. Another year, another Dry Slope Champs wrapped up. To the athletes, spectators, organisers and party planners, thank you for another lovely game of DC’s, see you on the slope next year!